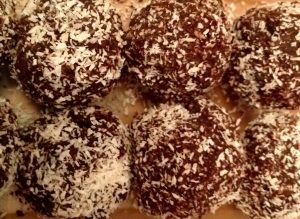 The memory on my taste buds inspired me to recreate these delicious energy balls. Around 25 years ago I visited a couple who came from USA to live at a small town, called Santa Fe, which is in Anzoátegui, Venezuela. They were experimenting with power food, and they only ate germinated, live food. A few days with them, gave me an understanding of what can nurture us in a way that we actually feel it in our brain, and how our mind becomes more aware. I had trascendental spiritual out of body experiences, and I could not stop eating those energy balls. I did not have the recipe, but my taste buds could recreate the flavour that I now share with you. I am not saying you will fly without wings by only eating these energy balls, but combined with a diet of germinated live food and meditation, your perception may expand and your senses could become more acute. Dry food: 8 pitted dates – 8 figs- 8 apricots – 1/2 cup currants – 8 prunes- 8 cardamom pods (use only the seeds) – orange and tangerine (mandarine) peel (I always dry some but if you don’t have, just use fresh grated, 1/3 cup) – 180 gr of fine ground almond – 100 gr ground cacao (cocoa) powder – 3 tablespoons of grated coconut – 2 tablespoons of fine ground coconut for coating the balls. Preparation: Chop the dates, apricots, prunes. Soak the dry grated coconut in apple juice. If you have dry orange peel and tangerine, put it together in the blender to pulverise it with the cardamom seeds. Use a bowl to mix all with the rest of ingredients, fine ground almond, cacao, coconut oil, and the honey. Mix with a wooden spoon and then use your hands to pinch some of the mix and make it into balls. Roll them on the fine ground coconut and they are ready to eat. I put them in a plastic container with a lid, and eat as when you need a kick! Enjoy and share.